The calorie content in Lettuce depends upon the kind of lettuce and also on its method of preparation. You may choose from Romaine lettuce and Iceberg lettuce. One cup of shredded raw edible romaine lettuce which weighs around 1.7 oz contains approximately 8 calories. One head of Romaine lettuce which weighs around 1 Ib has around 106 calories, one leaf of Romaine lettuce weighing around 1 oz contains 5 calories and 10 grams of romaine lettuce contains 2 calories. A raw edible small leaf of Iceberg lettuce weighing around 0.2 oz contains 1 calorie, a large Iceberg lettuce leaf containing around 0.5 oz contains 2 calories. A cup of shredded iceberg lettuce weighing around 1.8 oz has 8 calories, a small Iceberg lettuce head has 45 calories, a medium head of iceberg lettuce which weighs around 3 oz contains around 75 calories and a large head of iceberg lettuce which contains approximately 11.5 oz contains 109 calories. 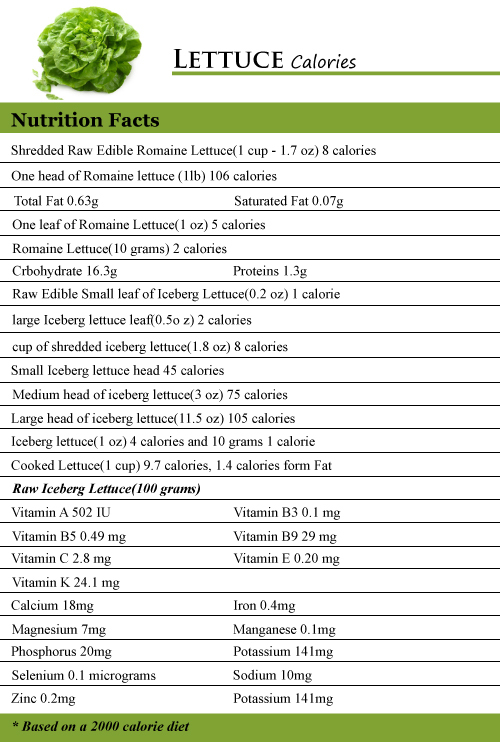 1 oz of iceberg lettuce contains 4 calories and 10 grams of iceberg lettuce has 1 calorie. One cup of cooked lettuce contains 9.7 calories out of which 1.4 calories come from fat. Lettuce also contains various other micronutrients that are beneficial for the body. 100 grams of raw iceberg lettuce contains around 502 IU of Vitamin A, 0.1 mg of Vitamin B3, 0.49 mg of Vitamin B5, 29 mg of Vitamin B9, 2.8 mg of Vitamin C, 0.20 mg of Vitamin E and 24.1 mg of Vitamin K. An equal serving of raw iceberg lettuce contains 18 mg of calcium, 0.4 mg of iron, 7 mg of magnesium, 0.1 mg of manganese, 20 mg of phosphorus, 141 mg of potassium, 0.1 micrograms of selenium, 10 mg of sodium and 0.2 mg of zinc. One raw iceberg lettuce has 95.6 grams of water, 0.1 grams of total fats, 2 grams of sugar, 0.9 grams of proteins, 1.2 grams of dietary fiber and 3.2 grams of carbohydrates.